Use this form to request an RSVP or simply give us a call at the restaurant. This form serves as only a request. The restaurant will need to contact you to confirm your request. PLEASE LEAVE A CONTACT NUMBER ON ONLINE RESERVATION REQUESTS. Thank you! We can no longer guarantee an open table without a reservation so be sure to secure a table before you come out. 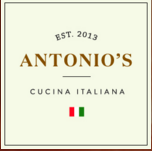 Antonio’s would love to have the opportunity to serve you! We plan for a two hour dining time slot for each reservations of 3 or more people. Please help us hold to that as we are limited to 12 tables. Thank you!